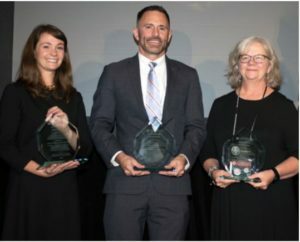 The Goldstein Award was presented on behalf of sponsor Carlton Fields by attorney Joe Lang, right, to Florida Justice Institute, represented by Erica Selig, Dante P. Trevisani, Carol Berg and Executive Director Randall C. Berg, Jr. 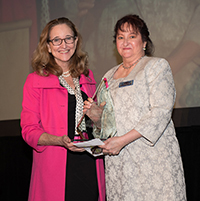 The Steven M. Goldstein Award for Excellence was created to honor a former member of the Foundation board who, as a legal services attorney and Florida State University College of Law professor, was devoted to defending the rights of the downtrodden, the unpopular and the disadvantaged. 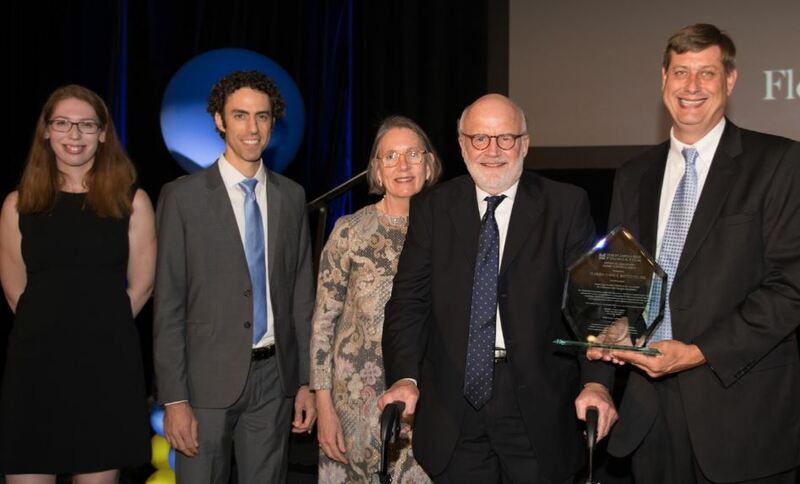 The Goldstein Award, given biannually at the Foundation’s annual dinner, recognizes projects of high quality and significant impact work by Foundation grantees. This year’s winning project involved securing accommodations for blind, deaf and wheelchair confined prisoners. In July, after two years of intense investigation and a year and a half of federal litigation, Florida Justice Institute (FJI) settled for its client, Disability Rights Florida, a historic lawsuit against the Florida Department of Corrections (FDOC) for its systemic failure to comply with federal laws protecting individuals with physical disabilities. FJI’s work impacted thousands of prisoners with physical disabilities who were excluded from jobs and programs, not receiving proper medical care, and being denied basic accommodations. In the suit, FJI cited a deaf prisoner whose important legal call with his attorney was cancelled because no interpreter was provided; a deaf prisoner who was handcuffed behind his back during a disciplinary hearing, making communication impossible; and a deaf and mute prisoner who was sexually assaulted but couldn’t communicate with a guard afterward. The FDOC failed to provide and maintain wheelchairs, confiscated and failed to repair prosthetic devices, and failed to consistently provide white canes to blind prisoners. 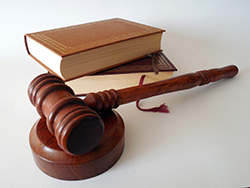 The settlement agreement requires the FDOC to make sweeping architectural changes, update its policies, and improve its practices for providing accommodations so that prisoners with disabilities have equal access to programs, services, and activities. To ensure compliance, FJI has begun an extensive monitoring effort, which is expected to continue until 2021. JALA’s Pro Bono Director Kathy Para and Executive Director Jim Kowalski accept the first runner-up Goldstein Award from Joe Lang. 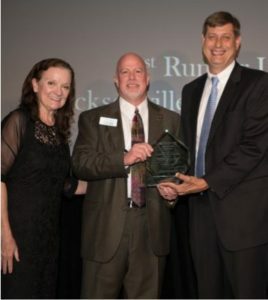 The first runner-up of the 2018 Goldstein Award was Jacksonville Area Legal Aid (JALA). After seeing a spike in the number of seniors who, despite being in compliance with the terms of their reverse mortgage, are being sued for foreclosure on false allegations that they abandoned their homes or failed to pay taxes or insurance, JALA launched a multifaceted advocacy approach, including litigating numerous individual cases, advocating for laws and regulations to better protect senior housing consumers, and educating consumers and advocates on the dangers associated with reverse mortgage products. Attorneys Katy DeBriere of JALA, Jeffrey Hearne of Legal Services of Greater Miami, and Kathy Grunewald of Florida Legal Services accept the second runner-up Goldstein Award. The second runner-up was a joint project of Florida Legal Services, JALA, and Legal Services of Greater Miami. The organizations collaborated to combat the terminations of thousands of vulnerable Floridians, many of whom were disabled veterans, from supplemental nutrition assistance (SNAP), commonly referred to as “food stamps.” More than a half million low-income Floridians’ services were terminated despite having legitimate barriers to employment.